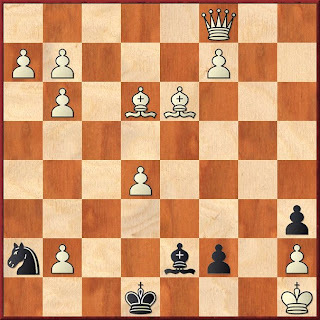 I found the first one straight forward (to solve) but very nice at the same time: 1. g7+ Kxe8 2. gxh8=Q Kf8 (with the threat to capture the queen by Bh6-Bg7) 3. e6! d6 4. d5 c5 5. c4 b4 (so far it was obvious without moving the pieces. 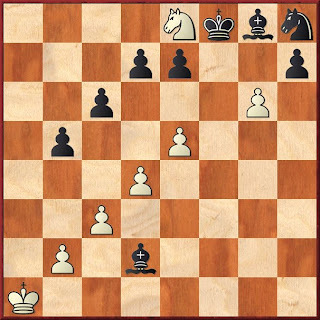 Then I need to set them up to realize: Firstly white can NOT win and secondly the Queen can sell it's life dearly) 6.Ka2 Bh6 7. b3 Bg7 (else the white queen does escape and wins) 8. Qxh7 Bxh7 pat. I made many mistakes solving the next one, which is why it took so long. 1. Bb3 Ke1 2. Bb4 Nc3! 3. Bxc3 Kf1 4. Bc4 (it took me a long time to find this move as you can't see it until you consider the first under promotion - but that one was the EASY part with hindsight) Bxc4 5. Qc5 Bd3! 6. Qb5 (this move and the next are almost obvious once you notice white's Bc4) Bxb5 7. b8 = N (I had actually suspect this under-promotion before even thinking of Bc4, but I got really stuck here. In fact, this is where it becomes very beautiful, black can now force 2 additional under-promotions! That's the problem I had solving it for, I think, almost a week) Bd3! 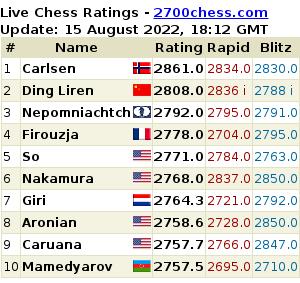 (else it is easy, Be2 f8=R wins quickly and Bc4 a8=Q also wins) 8. a8=B! Be2 9. f8=R game over! A brilliant tour de force. Very appreciated. Given that there is absolutely no Velcro, plastic gucci replica, over-sized areas, or maybe big marks on there, the item qualifies to be in that type. Most of these wristwatches is usually utilized with proper functions or maybe relaxed functions. Bracelets Bejeweled wristwatches are classified as the past type. Most of these gals wristwatches usually are people that had taken longs cycles connected with chanel replica handbags for being made in addition to assemble. Most of these portions usually are garnished having gallstones in addition to cherished gems, and are also printed in line with coloration in addition to understanding previous to currently being that is set in this check out. That heritage connected with gals wristwatches can be quite useful simply because include fake louis vuitton a whole lot after some time by necklaces to help jean pocket wristwatches towards modest portions we have now currently. Try to remember to settle on a wristwatch that you will be at ease in case you're forced to opt for one check out, ensure that this can be a "crossover" -- just one tag heuer replica sale last longer than in excess of between several different types preceding. You will discover several sorts of check out activities: Quartz Wristwatches, Information The wind Wristwatches, in addition to Intelligent Watches(Self-Winding). Thus, it is important to recognise what kind is usually of this personal preference. cartier replica sale:. Most of these wristwatches usually are powered having power supply , nor need to have many repair. Commonly this power supply ought to be substituted annually of every 24 months.